Each year at the conclusion of the WebAward program, we ask our esteemed panel of WebAward judges a series of questions to help participants better understand what the judges are looking for and to improve the website recognition program for the next year. On the survey last year we asked “When judging a site, what usually had the greatest positive impact on your score?” 35.6% of the judges responded that outstanding design was the thing that helped bring up a score. The criteria that had the second most responses was ease of use with 23.7%. 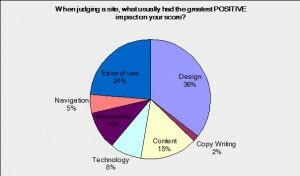 Content was in third with 15.25% of the judges relying on this criteria the most. At the other end of the scale, we also asked what had the most negative impact on your scores. 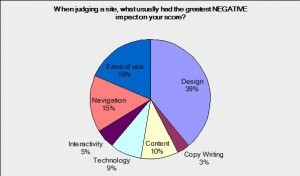 Not surprising, 39% of the WebAward judges said that bad design was the top criteria when they scored a site poorly. Ease of use (18.6%) and Navigation (15.25%) also played a factor when the judges felt a website did not live up to its potential. These results remind us that first impressions are important when developing a website. Even though the WebAwards uses seven equally weighted criteria to determine a websites final score. Judges are asked to review the site as though they were the target audience. They then add their experience and expertise and understanding of current web trends to provide a score for the entry. With each entry being reviewed by up to five different judges, we then take the average of the top two scores to determine the entries final score. This way we strive to provide the most fair judging of any awards program available to the online marketing community. Web Management and Marketing: The Peer-Reviewed Journal is a major new professional journal publishing in-depth articles and case studies on all aspects of management and marketing in the rapidly changing environment of ‘The Web’. Each quarterly 100-page issue provides actionable advice written by and for web professionals on topics ranging from web design and development to content strategy, and from website regulation to search engine marketing. 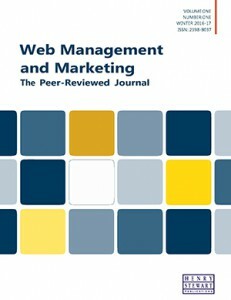 Web Management and Marketing: The Peer-Reviewed Journal provides a high-quality, peer-reviewed forum to showcase innovative strategies, techniques and best practices employed by major brands, the public sector and not-for-profits around the world that maximize customer experience and ROI. To pay by credit card from within North America call 800-633-4931 or subscribe online. • In the rest of the world call +44 (0)207 092 3474 or subscribe online. • Or just email francesca@hspublications.co.uk . We can send an invoice if you prefer. Use discount code “WMMWEB010” to receive 10% off your subscription. The Web Marketing Association will be announcing the winners of the 15th annual Internet Advertising Competition awards on March 28, 2017 on the IAC Awards Website. Judges from all over the world have reviewed each entry and have selected the best in nine different advertising formats. We thank our judges for their time and expertise in selecting our winners. 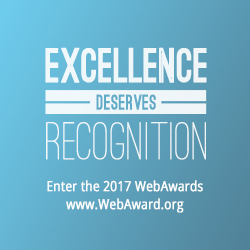 Excellence deserves recognition and the Web Marketing Association is looking for experienced Internet professionals who can help judge the Websites that are entered into its 21st annual international WebAward competition, the standards-defining award program that sets industry benchmarks based on the seven criteria of a successful Web site. Interested individuals can submit their names for consideration using the WebAward Judges Nomination Form. The 2017 WebAward Competition for Website development is currently accepting entries until May 31, 2017. Judging will begin in mid-June and run through early August. “The vast majority of our judges return each year to participate again as a WebAward judge, but some need to take time off from judging and because of the popularity of the WebAwards there is a constant need for new judges”, said William Rice, President of the Web Marketing Association. “Prior to the beginning of the judging, we spend several weeks discussing the current state of Web development and how it should be recognized through the WebAwards. Being a WebAward judge is a valuable experience that helps the individual better understand overall Web development and of course looks impressive on a resume or corporate bio”. The Web Marketing Association is looking for the best retail Websites in the world as part of their 21st annual international WebAward Competition for Web site development at www.webaward.org. The WebAwards is the standards-defining competition that sets benchmarks for 96 industries, including retail and shopping websites, based on the seven criteria of a successful web site. The deadline for retail or shopping websites to enter is May 31, 2017. Retail and Shoping Websites can be entered into consideration for the 2017 Best Retail Website WebAward at the WebAward Website. The Web Marketing Association is looking for the best non-profit and advocacy Websites in the world as part of their 21st annual international WebAward Competition for Web site development at www.webaward.org. The WebAwards is the standards-defining competition that sets benchmarks for 96 industries, including advocacy, arts and non-profit websites, based on the seven criteria of a successful web site. The deadline for public interest websites to enter is May 31, 2017. There is also a reduced entry fee for sites entering the Non-profit industry category. Web sites are judged on seven criteria including design, innovation, content, technology, interactivity, copy writing and ease of use. Each WebAward entry is judged against other entries in its industry category and then against an overall standard of excellence. All entrants benefit from receiving valuable feedback in terms of their specific scores compared against the average scores for their industry. They also may receive specific comments from the WebAward’s professional judging panel on their Web site development efforts. Each year the Web Marketing Association names the Best Advocacy Website based on the scores submitted by the competition judges. 2008 – Clarity Coverdale for Fury Are You Ok With That? Non-Profit and Advocacy Websites can be entered into consideration for the 2017 Best Advocacy Website WebAward at the WebAward Website. The Web Marketing Association is looking for the best PR Websites in the world as part of their 21st annual international WebAward Competition for Web site development at the WebAward Web site. The WebAwards is the standards-defining competition that sets benchmarks for 96 industries, including advertising, PR and marketing web sites, based on the seven criteria of a successful Web site. The deadline for public relations web sites to enter to be judged is May 31, 2017. Web sites are judged on seven criteria including design, innovation, content, technology, interactivity, copy writing and ease of use. 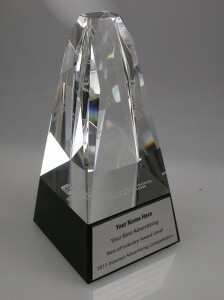 Each WebAward entry in the advertising category is judged against other advertising entries in its industry category and then against an overall standard of excellence. All PR entrants benefit from receiving valuable feedback in terms of their specific scores compared against the average scores for their industry. They also may receive specific comments from the WebAward’s professional judging panel on their Web site development efforts. A highlight for your resume. Each year the Web Marketing Association names the Best Public Relations Website based on the scores submitted by the competition judges. 2008 – Sharpe Partners for the Burns Group Website. PR and Advertising-related Websites can be entered into consideration for the 2017 Best Public Relations Website and other advertising related WebAwards at the WebAward Website. The 2017 WebAwards are sponsored by the following leading organizations: PR.com, EContent Magazine, iContact, ad:tech conferences, Cranbery Radio, and Website Magazine. The Web Marketing Association thanks these companies for their commitment to the entire online marketing community. The Web Marketing Association is looking for the best faith-based Websites in the world as part of their 21st annual international WebAward Competition for Web site development at the WebAward Web site. The WebAwards is the standards-defining competition that sets benchmarks for 96 industries, including all religious denominations web sites, based on the seven criteria of a successful Web site. The deadline for advertising web sites to enter to be judged is May 31, 2017. All faith-based entrants benefit from receiving valuable feedback in terms of their specific scores compared against the average scores for their industry. They also may receive specific comments from the WebAward’s professional judging panel on their Web site development efforts. Faith-based or religious Websites of all denominations wishing to be considered for the Best Faith-based Website can submit their website for consideration at WebAward.org. The Web Marketing Association is looking for the best Energy Websites in the world as part of their 21st annual international WebAward Competition for Web site development at www.webaward.org. The WebAwards is the standards-defining competition that sets benchmarks for 96 industries, including energy websites, based on the seven criteria of a successful web site. The deadline for energy websites to enter to be judged is May 31, 2017. Each year the Web Marketing Association names the Best Energy Website based on the scores submitted by the competition judges. Energy related websites can be entered into consideration for the 2017 Best Energy Website WebAward at the WebAward Website. Participants can improve their chances on winning a WebAward by visiting the Web Marketing Association Facebook Page and becoming a fan of the page. The Web Marketing Association will be providing hints and tips on how to improve your chances on winning a top award though out the award program entry period.